Betsy believes that God opens and closes the womb. As humans, we may think that we’re in control, and sometimes we do shut the womb permanently, but many times when people think that they are in control of their conception, God reveals Himself by surprising them with a child, or no child. Either way, Betsy is totally convinced that childbearing (or infertility) is a walk of faith–and sometimes that walk can be very hard! Betsy believes that a pregnancy is impacted by nutrition, lifestyle, and exercise. If a person is what he eats, how much more so a person is what his mother eats while he is in the womb being formed. Many of the “woes of pregnancy” can be prevented by eating and drinking correctly, moving correctly with exercise and posture, and living in a simple, healthy, peaceful environment. A “peaceful environment” doesn’t mean that every pregnant woman should move away from stress. That would be impossible. It does mean that she should actively change her environment, and the way she responds to it, so that her stress is lessened as much as possible. Many of the sicknesses associated with pregnancy, such as toxemia, pregnancy-induced hypertension, pre-term labor, and gestational diabetes can be forestalled or avoided completely with nutrition, exercise, and lifestyle. The thought then follows that a pregnant woman can determine, to a certain extent, the type of pregnancy that she has by the choices she makes. So Betsy depends upon her clients to take charge of their pregnancies, following the guidelines that she gives. Betsy facilitates a good pregnancy, but ultimately a good pregnancy is the mother’s responsibility. Betsy believes that every birth is a miracle. She does not take a “normal” birth for granted, but thanks God for each child that is born into her hands (or the daddy’s hands!). She has seen some complications, and knows that she is completely dependent upon the Lord to guide her through each labor and delivery. When God was first leading Betsy into midwifery, He promised that He would guide her every step of the way. That has been a promise that Betsy has held onto over and over throughout every baby’s birth. So, with every birth you may not see Betsy praying, for she may not do so out loud, but she will be praying. Sometimes her prayers are just prayers filled with thanks, but other times, her prayers are pleas for wisdom, strength, or inspiration. Betsy also believes that most births can happen without a lot of help. By this she doesn’t mean that she believes women don’t need support and love during childbirth. She means that most women don’t need artificial help, such as induction, drugs, or episiotomies, to accomplish the birth of their child. This is part of the miracle, the fact that God made a woman’s body capable of such a thing as birth. If a woman goes into childbirth believing that she can accomplish it, in fact that she was created for it, most of the time it can be accomplished naturally and without intervention. The reason that Betsy’s practice is called “First Light” is because at birth that’s what each baby sees. Birth is when a baby first lets light into his world. A birth can be a time of blinding light, harsh light, soft light, warm light, embracing light, dim light, cold light, and on and on. The possibilities are as endless as the number of adjectives in our language. All parents have in mind the kind of light that they want their new baby to experience, and as far as is possible, she facilitates that. The first light that Betsy wants each of “her” babies to experience is that of the Light of the world, Jesus. She asks for His presence to be at each birth, and His light has been in the room of every one of the births at which she’s been privileged to serve. 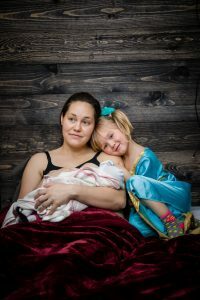 Betsy also believes that childbirth is only the beginning of parenthood, and her clients may need her more after birth than before. 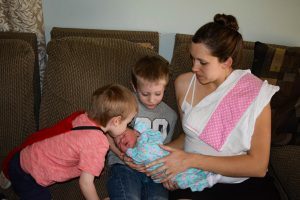 She makes herself available to help her clients with postpartum questions, whether they are questions about the mother or the baby or both. Being a person’s midwife is much more than a professional relationship. One of her midwife teachers said that a midwife is your friend for life. Betsy keeps in touch with most of her previous clients. There’s a depth of relationship that develops with the childbearing year. Most of her clients become her friends and family, and Betsy loves getting pictures and notes from them long after the baby is born. 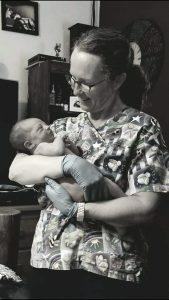 Betsy believes that her roles as midwife include servant, facilitator, encourager, teacher, mother, and support person. She is not in charge of the birth. Betsy is there to help and guide, but ultimately, God, the parents, and Betsy — in that order — are a team that works together to bring each child into First Light.